The Musée d’Art Moderne de la Ville de Paris is currently devoting a wide-ranging retrospective to American artist Keith Haring (1958-1990). The exhibition will bear witness to the importance of Haring’s work, in particular its profoundly “political” content, apparent in his work throughout his career. Keith Haring was one of the most well-known artists of his time, and even today his inimitable style, with its strong, graphic line and repertoire of emblematic signs, remains familiar to all. Beginning with Documenta 7 in 1982, his work was exhibited alongside that of Andy Warhol, Jean-Michel Basquiat, Roy Lichtenstein, Robert Rauschenberg, Jenny Holzer and Daniel Buren, as well in museums and biennials around the world. 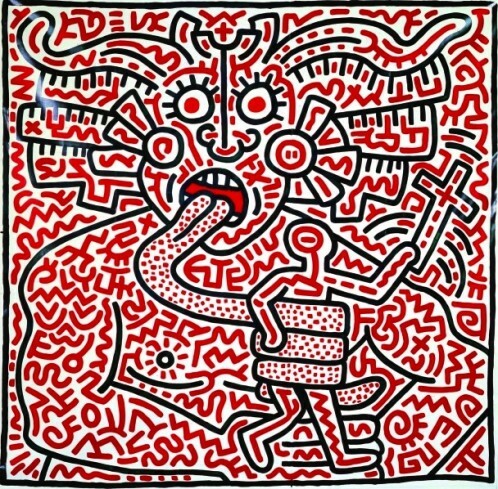 Haring studied at the School of Visual Arts in New York. Endowed with a genius for line, this virtuoso draughtsman – even as a child he drew endlessly – worked rapidly, tirelessly and was enormously prolific, frequently making work to the accompaniment of music. He worked on all kinds of surfaces and his response to contemporary media included disseminating reproductions of his imagery on merchandise, via his New York retail store, the Pop Shop, which he opened in 1986. The political messages and ideas he communicated were not only a part of his legacy; they have had a very real influence on other artists and on society. His “subway drawings” paintings, works on paper and sculptures speak of social justice, individual freedom and change. 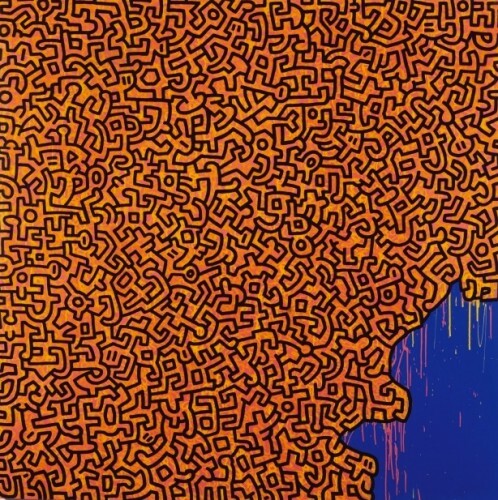 A subversive, militant Pop icon, Haring was committed to social causes throughout his life: even when very young, he was driven by an urge to change the world. Consciously and frequently choosing the street and public spaces to make contact with the widest possible audience, he fought indefatigably against racism, capitalism, violence and injustice in all their forms, with a particular emphasis on apartheid in South Africa, the threat of nuclear war, the destruction of the environment, homophobia and the AIDS epidemic (diagnosed HIV-positive in 1988, he established a charitable foundation, dedicated in part to helping those affected by AIDS and HIV). The layout of the exhibition provides a narrative of Haring’s socio-political obsessions.